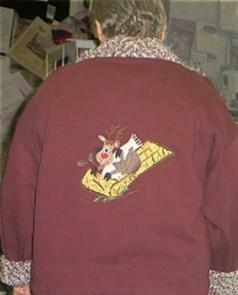 Barb Volzer models the jacket she made in Sharon's "Rufus" class. Barb made the chenille collar and cuffs from plaid. 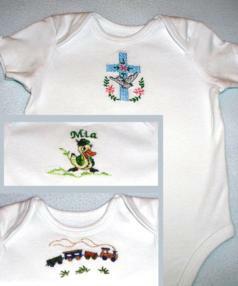 Designer's Gallery software helped Thelma Evankovich create this set of onesies as a baby gift. She used Studio III to convert the original Pfaff designs,add a basting stitch and print actual size placement templates, SizeWorks to resize them, DensityWorks to reduce the density, ColorWorks to check the colors and LetterWorks to arch the baby's name over the little duck embroidery. Perfect attire for the well dressed summer newborn. This penny rug was done using the 4x4 Baby Lock embroidery machine (the blocks, designs, pennies, and tongues were all embroidered then sewn together on the Baby Lock Quilter's Choice, which also blanket-stitched the outside edges. The gold wool roving was felted onto the runner using the Baby Lock Embellisher. Shirley made this project for a friend. The mittens were embroidered using in-the-hoop designs, then glued onto the wool felt background fabric. 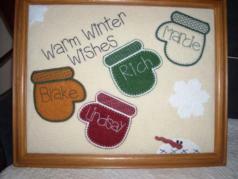 The snowflakes and snowman were embroidered directly onto the wool felt background fabric then sprinkled with glitter. 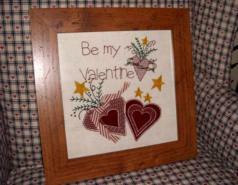 This embroidery project was done on Shirley's 4x4 Baby Lock embroidery machine (it took 5 hoopings). Since then she has moved up to a machine with a larger hoop and is enjoying the extra space as she creates more "updated primitives" to go with her decorating style.